This classic Spanish helmet is made from 18 gauge steel and polished to a high sheen. It features brass studs on the sides of the helmet, the traditional flat brim, and crescent shaped crest running front to back. Fully wearable, this helmet is perfect for costumes, media productions, and more. 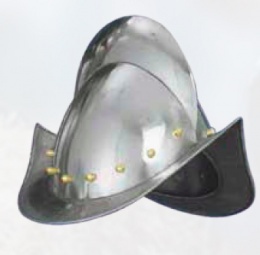 A morion is a type of open helmet used from the middle 16th and early 17th centuries, usually having a flat brim and a crest from front to back. It was introduced in the middle of the 16th century, contemporaneous with the exploration of north, central, and southern America. Explorers like Hernando de Soto and Coronado may have used them for their foot soldiers in the 1540s. This page was last modified on 13 May 2014, at 13:35.